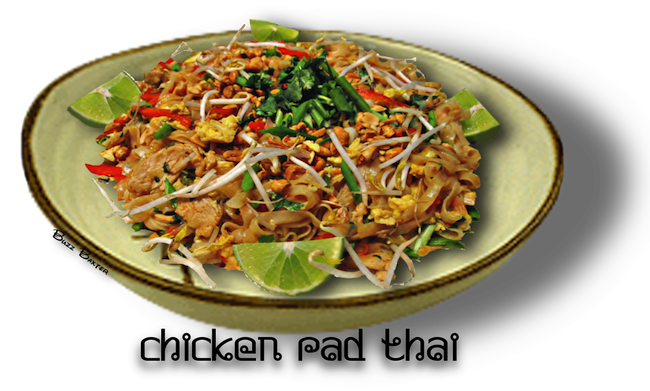 CHICKEN PAD THAI - TENDER STIR-FRIED CHICKEN WITH RICE NOODLES, TOFU, BEAN SPROUTS AND A WONDERFUL SAUCE. A Thai dish that is a favorite with everyone that has had the opportunity to try the National Dish of Thailand. Make it at home and bring a little of South East Asia to your table. All ingredients readily available in most good supermarkets, so serving this exotic dish to your family is simple yet rewarding. •  1 boneless, skinless whole chicken breast, cut into strips. for about 15 minutes), and drain. Set aside. them with a spoon, until egg is just set. Transfer everything from wok to a bowl. Wipe out the wok. **Add the vinegar, fish sauce, palm or brown sugar, and heat through. chicken and eggs, and toss thoroughly.